Disappointment for RSA at Mens Marathon. 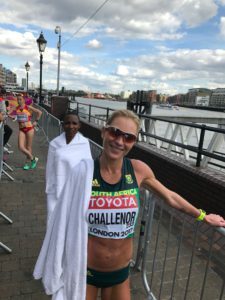 Only two of the selected SA marathon trio made it to London, and only the quietly spoken Desmond Mokgobu was able to complete the course, but by hanging in the Gauteng athlete finished 21st in 2:16:14. A top 25 finish in world championships marathon put the athlete on the IAAF gold label list which results in being invited to more and paid higher fees and packages to run the label events. This is a major benefit for marathoners who realistically can only compete two times a year at major level. The way the race unfolded meant that there was a very large group of runners together for the majority of the race and this, together with reasonable weather conditions, would have been ideal for improvements in relatively slow PB performances owned by the South African team. However, the trio were hit even before the race started, with Lusapho April not even making the flight as a result of a passport hiccup. Reports are that his passport had insufficient clean pages for the visa and stamp to be issued. This is said to be a basic logistical preparation for all travelers who are required to have at least three clean pages before departing a country. Sisbusisu Nzima entered the race with the goal of finishing in the top 25 in order to get make the IAAF road label list, but pulled out at 27km due to cramps while lying around 23rd position. At that time Mokgobu was in 34th some 36 seconds adrift. As the number of DNF’s increased Mokgobu moved up to be 20th at one stage but surrendered a position by the finish line. Both athletes put their disappointing performances down to insufficient training and the limited notice period in order to prepare for the marathon distance. The marathon selection was confirmed by ASA at the Half Marathon championships. The outstanding, and unexpected performance of the day went to Scot Callum Hawkins who is the highest placed Briton ever in the history of the World Championship marathon. With only two South Africans entered in the event, and both yet to break the 2:30 barrier, there were only times and experience on offer. The women’s race took a similar start with a massive group finding their feet over the first lap. 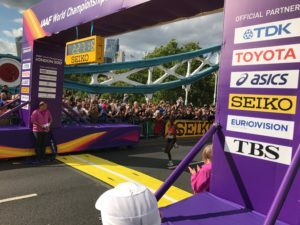 Mapaseka Makhanya was only 9 seconds off the pace at 10km while Jenna Challenor opted for what appeared to be a more conservative approach clocking 36:58 at the same mark. Aly Dixon was the one to shake the race up, opening a substantial lead by half way, but this was eaten away to just 15 seconds by 25km, and saw the British athlete dropping to 12th by 30km. Makhanya and Challenor found the going hard into the third lap slowing and clearly exchanging any potential of a PB for the determination of a finish. Up front there were still six in contention as they went through 40km. 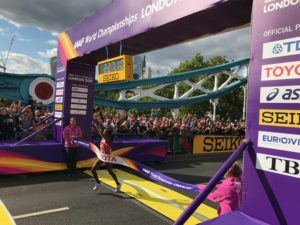 Barundi’s Rose Chelimo, Edna Kiplagat and American Amy Cragg applied the pressure, but this trio remained inseparable until the final, slightly uphill, 400m to the Tower Bridge finish. 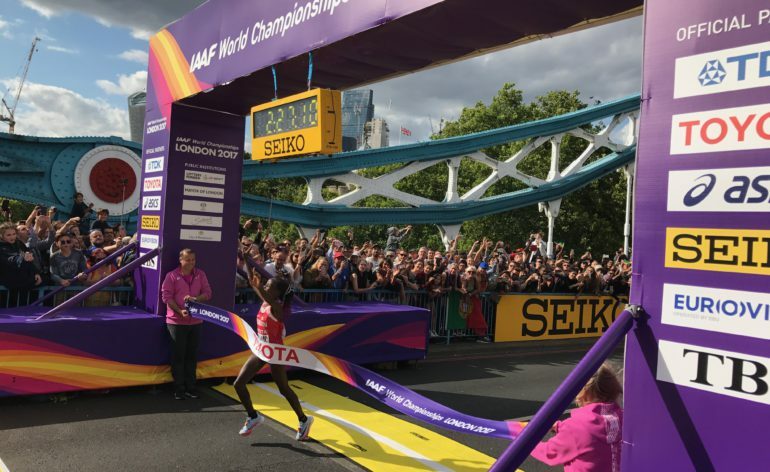 Chelimo’s sprint at the bend set her free to record 2:27:11, while only a line judge could separate Kiplagat and Cragg who shared a time of 2:27:18. Makhanya stubbornly completed the course, even reduced to a walk for the final 5 metres but achieving 40th place in 2:40:15. Rigor mortis appeared to set in immediately the 32-year-old crossed the line where she was assisted by officials. 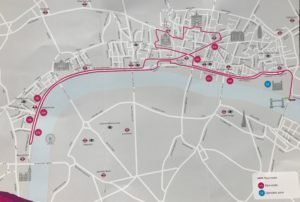 For Challenor, who was initially on a 2:35 pace, the finish line was reached in 2:47:22 for position 59. 78 of the starters completed the course in just over three hours.